The Anuradhapura Conference on Environmental Conservation, which is a part of President Maithripala Sirisena’s National Environment Conservation Programme (Punarudaya), will commence at the Salgado grounds in Anuradhapura, on February 14. 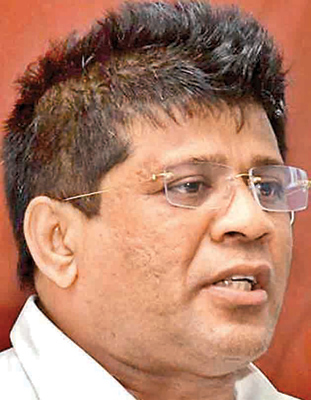 Sate Environment Minister Ajith Mannapperuma said the Anuradhapura Conference would be the first of a series of region-based conferences that would discuss environmental issues common to the given areas. Accordingly, the Anuradhapura Conference on Environmental Conservation will focus on environmental issues that are prevalent in Anuradhapura. He was speaking at a press brief held at the Mahaweli Center in Colombo, yesterday afternoon. The state minister said that the Environment Ministry, under the patronage of President Maithripala Sirisena, was on a mission to create younger generations sensitive to the environment as well as sustainability. The ministry, as a part of the National Environment Conservation Programme, will focus on deforestation, policy changes, reforestation, waste disposal, the animal-human conflict, clean beaches, and gene theft, he added. The government has established an institution to bring together development policy designing and environmental policy formations under a single authority. The institution would overlook the balance between designing and implementing these different policies. “The institution is new, and we are still finding our footing. We expect a lot of foreign funding for the institution,” Mannapperuma said. He added that the government aims to increase the forest cover in the country from 29 percent to 32 percent by 2020. He said that following the intervention of President Sirisena in environmental affairs, deforestation had dwindled to one percent. He also said that the annual forest growth in the country was around four percent. “Even though we say we have a 29 percent of forest cover in the country, we need to remember that 60 percent of that percentage is concentrated in the North and East, which were unharmed due to the war. Therefore, we cannot brag about the forest cover we have. The forest cover should be uniform throughout the country,” State Minister Mannapperuma said. He added that the government aims to make the registration of all chainsaws compulsory in the coming months. “We request owners of chainsaws to contact the nearest police station about them between February 15 and March 15. We shall then commence the registration process, where chainsaw owners will be provided with licences to use them,” he said. “Following the limitations on cutting trees for timber requirements, the importation of timber has increased at a very high rate. We spend about Rs.13 billion on timber imports,” the state minister said. “Therefore, we need to find a solution for this issue as well. At the moment, we are exploring the possibility of making forestation a compulsory part in tender agreements when allowing commercial tree plantations, such as pine, in the country.” State Minister Mannapperuma added.